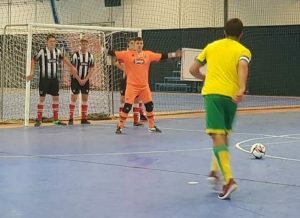 Grimsby Town Scholarship goalkeeper Alex Lait pushing boundaries by signing for Sheffield FC Futsal team that currently play FA National League Division 2. Great move for Alex to play for a club that takes its futsal very seriously. Every corner, every move has a set play and consequence. Couple seasons ago Sheffield was National champions, with recent signings they are moving back in that direction. Sheffield FC are worlds oldest football club. This entry was posted in GTFC Futsal on February 13, 2019 by Kevin Bryant.